Welcome to Crowne Plaza Glasgow. A modern and stylish hotel overlooking the River Clyde, with a direct link to the Scottish Exhibition & Conference Centre(SECC),Crowne Plaza Glasgow is an excellent choice for the business and leisure traveller and has recently achieved the HotelReviewScotland award for Glasgow Hotel of the Year 2007 and Scottish Conference Hotel 2007 283 air conditioned contemporary bedrooms and suites with wireless internet access. Spacious Club Rooms boasting Kingsized beds with stunning river views, plasma screens and exclusive access to our Club Lounge, with complimentary refreshments to relax or hold informal meetings. The Leisure Club includes an indoor heated swimming pool, fully equipped gym, sauna, spa and steam room. Alternatively, treat yourself to a massage or beauty treatment. 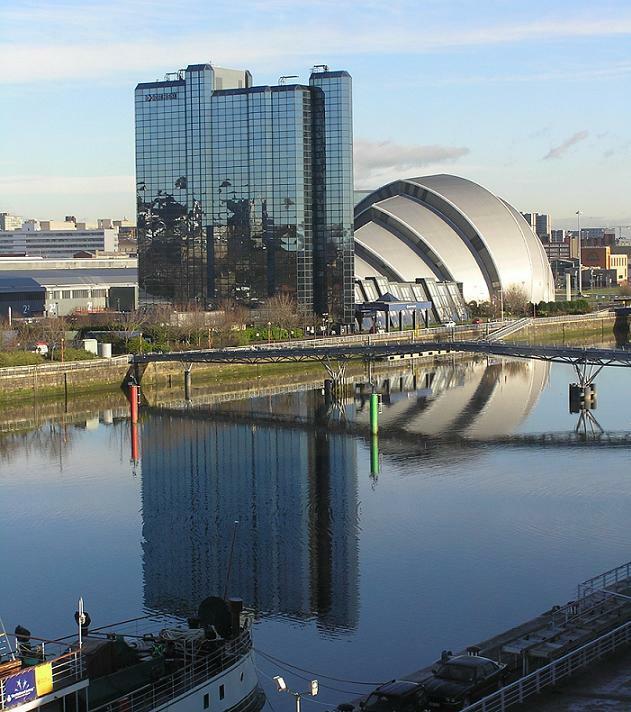 The hotel is located directly opposite the Glasgow Science Centre, the new BBC and STV Headquarters and we are within walking distance of the Tall Ship visitor attraction. Easy access to shopping areas such as Braehead, Buchanan Galleries, Argyle Street make this a great leisure destination. We are pleased to announce the completion of a major refurbishment of all bedrooms, conference suites and ground floor areas. Dedicated boardroom and syndicate rooms, all with plasma screens, complement the extensive facilities in the Argyll and Castle Suites. The hotel is now non-smoking throughout.